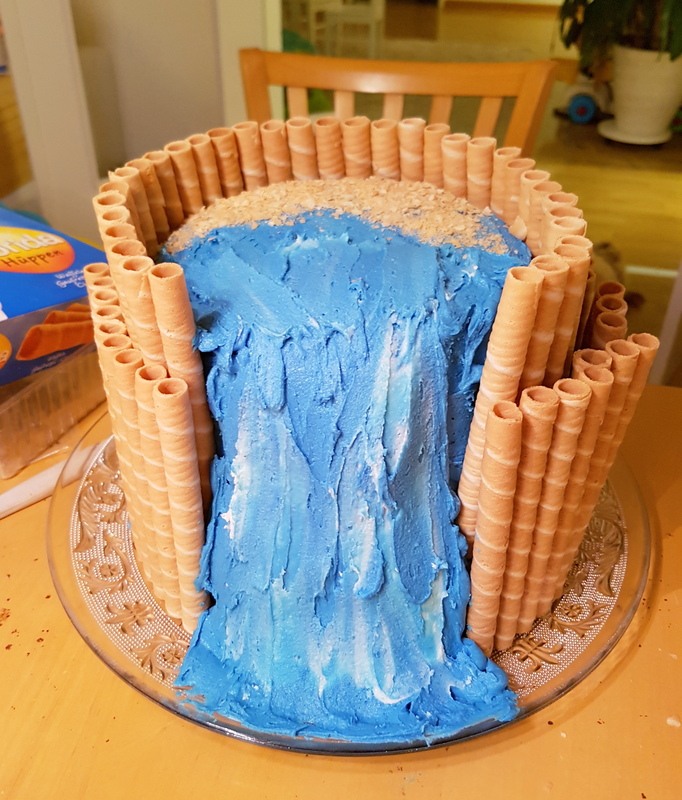 I love how it turned out so I definitely recommend this cake for those who want to make a Moana cake themselves as it doesn't require professional baking skills. I have inadvertently started a tradition with our now 4 year-old by making all her birthday cakes thus far. She loves looking through pictures of all the cakes she's had and is now thoroughly against the idea of having a bought one. Now, to be clear, I enjoy baking but I am by no means a professional. Let's just say that I have the standard know-how, can follow a recipe and tweak it to my tastes. 1. It has to require the standard baking skills. I'm willing to do a little bit more, learn something new but within reasonable perimeters! 2. It has to require the standard baking tools i.e. no fancy professional gadgets or blow torches etc. Anyway, at some point, her dad and I were discussing her birthday and the topic of the cake came up and he suggested a Moana cake. I dismissed it at first because I could imagine what the Moana cakes looked like and I had nowhere near that kind of skill level! But out of curiousity, I googled Moana cakes. By the way, there are so many amazing ones out there! If Miss now 4 would've been ok with us ordering one, I would definitely have ordered one of those professionally-made ones! Then I came across the waterfall Moana cake. Basically, Moana (or Moana with the other characters) standing at the top of a waterfall. I came across this particular one on ezeBreezy with the article on how they put the cake together. I looked at it and realized I could do it! Or at least give it a good try. And it actually turned out better than I expected. I did make some changes. I cut the cakes into layers, base cake in half and the top, three layers. And I used chocolate frosting for the layers (the cakes were chocolate. Are you guessing my family likes chocolate?). In the link, they used pirouline cookies. We surprisingly couldn't find them here at the right size so we ended up finding these waffle ones for ice cream and they were not only the perfect height, but wide as well so you don't need as much as you would with piroulines. 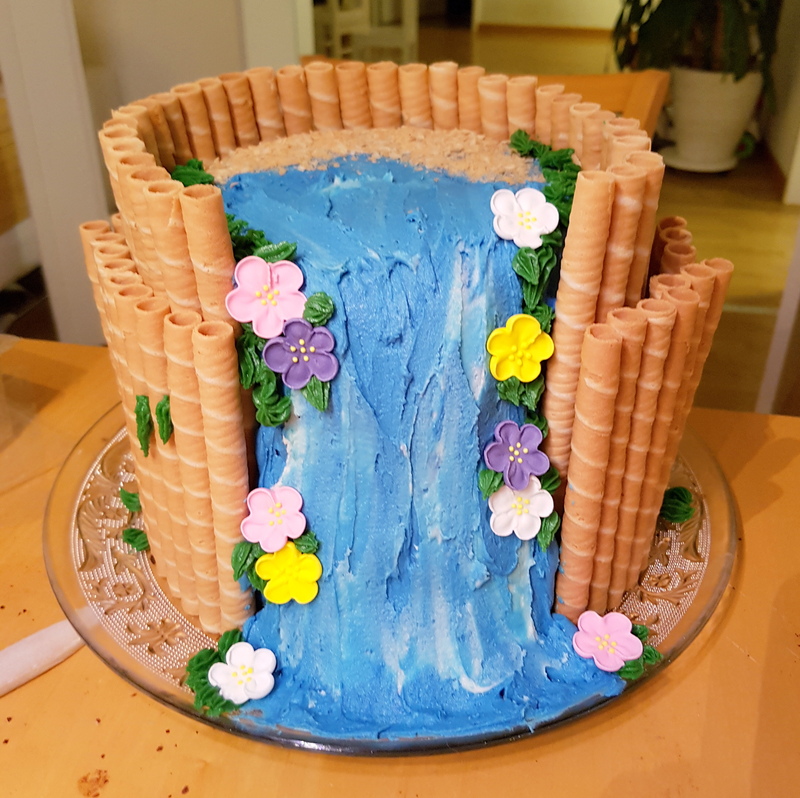 And it was perfect that they were plain with no filling because the cake uses a lot of frosting, especially for the waterfall, that you really don't need the added sweetness! 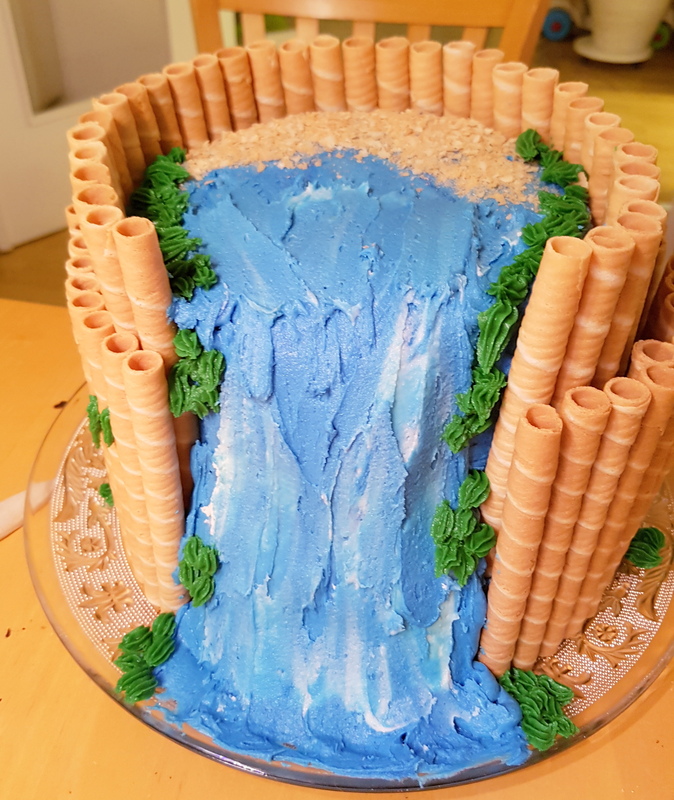 In the link, they don't actually show/tell how they built up the frosting/icing to make the waterfall. I wondered because I know how frosting can stick to the spatula. So I decided to pipe it and it worked wonderfully. I just piped the frosting all over on the side, used the spatula to spread it out and kept piping more and spreading until I had the desired look. I also left a bit of the frosting white (about a tablespoon amount) and used that at the end, smearing it with the spatula to give dimension to the "water". 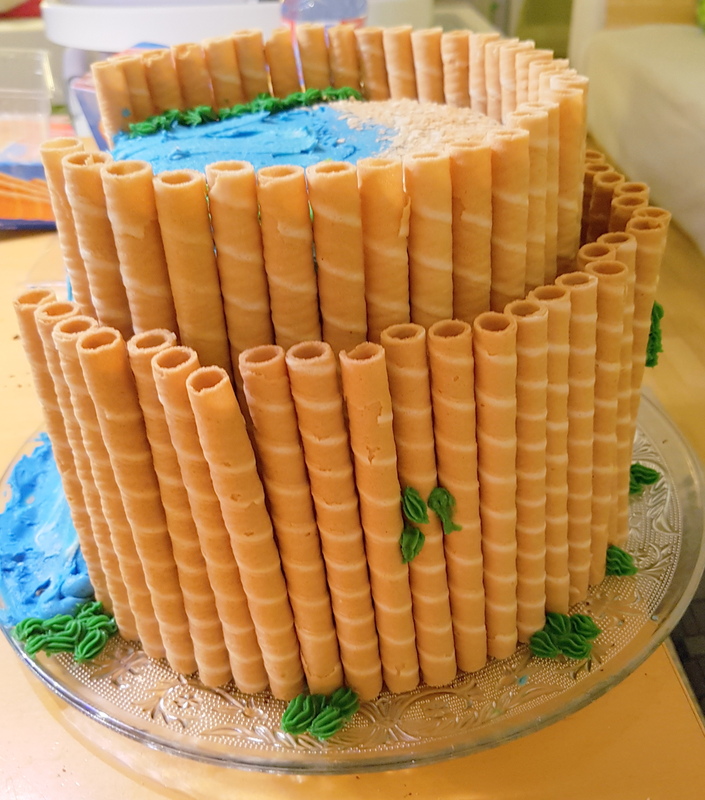 I didn't have the piping nozzle that was used in the recipe for making grass/greenery but I looked up some other cakes and saw some using the standard star nozzle, which I had. So I used that and actually ended up preferring that look to the other. And last but not least, I found a shop here that sells sugar flowers so I used those as I wanted as much of the cake as possible to be edible. The cake was a hit with kids and adults alike so I'm so glad that I found that article. If it weren't for the article, I never would have considered doing a Moana cake so Vinaka, ezeBreezy! You really did simplify this cake for me! So, for those out there who are interested in doing a cake like this, but maybe still need more convincing that it is simple (bear in mind, simple doesn't mean quick. You still have to wait for the cakes to cool, make frosting etc. 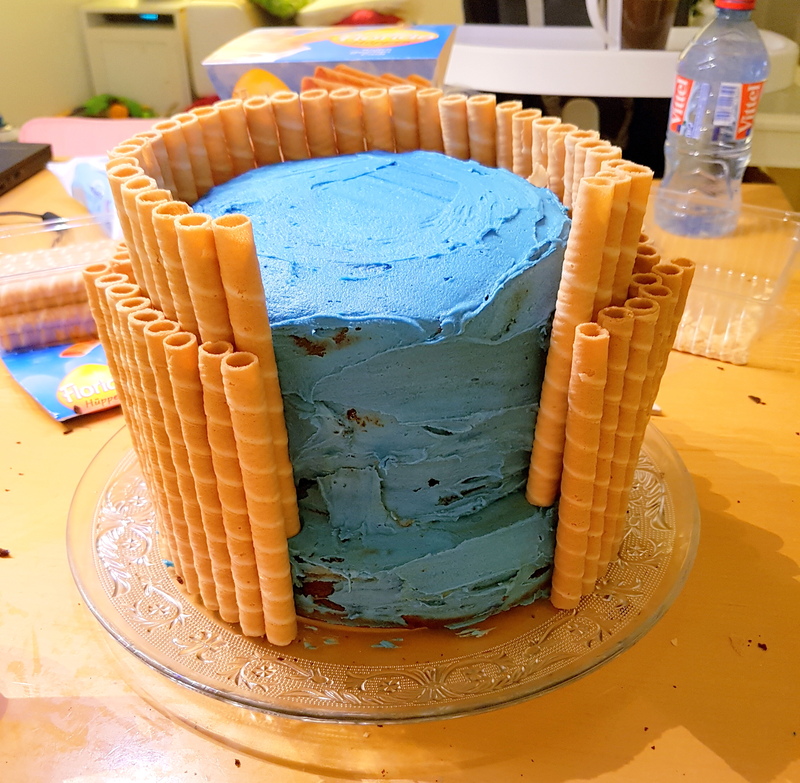 ), I hope the pictures I included of my attempt helps to give you a better idea of how it can be done and that it really doesn't require professional baking skills. I took most of the pictures with my phone because I was finishing up the cake at night but the last picture above and the main picture of the finished cake with Moana on top are both in daylight on the day of the birthday. I really enjoyed making this cake, even if it took me most of the night! (I had to wait for the Birthday Girl to go to sleep) and I loved the end result. If you have any questions at all, please don't hesitate to let me know below or message us directly. I know how much work goes into trying to make something special for your little ones or anyone special, for that matter! Btw, how amazing it is to have a Pacific Disney princess!! !